Time for some more wedding ginspiration (woo!). This month we’ve tried ‘lighthouse gin’ from one of mine & Euan’s favourite countries; new zealand! Inspired by the cape palliser lighthouse on new zealand’s north island, lighthouse gin is handcrafted with mountain water from the rimutaka range and uses a blend of botanicals, including zest from both oranges and lemons. Their aim being to create a smooth & fresh gin, with herbal and citrus characteristics. Visit their website for more info about lighthouse gin. Gin facts are great, but not quite as great as constructive feedback… Euan braved the gin straight (I am yet to try one of these gins straight… any tips? ), and was impressed with how easy it was to enjoy. Zingy, zesty, and fresh were his adjectives of choice, and although the initial smell was strong he actually found the gin to be more ‘tasty’ than throat-burning. With the gin came a basil flavoured tonic which they recommend. We decided to try one glass with the basil tonic, and one glass with an ordinary tonic to compare. To begin with we tried the gin with no garnish and then added lime, again just to explore the difference. 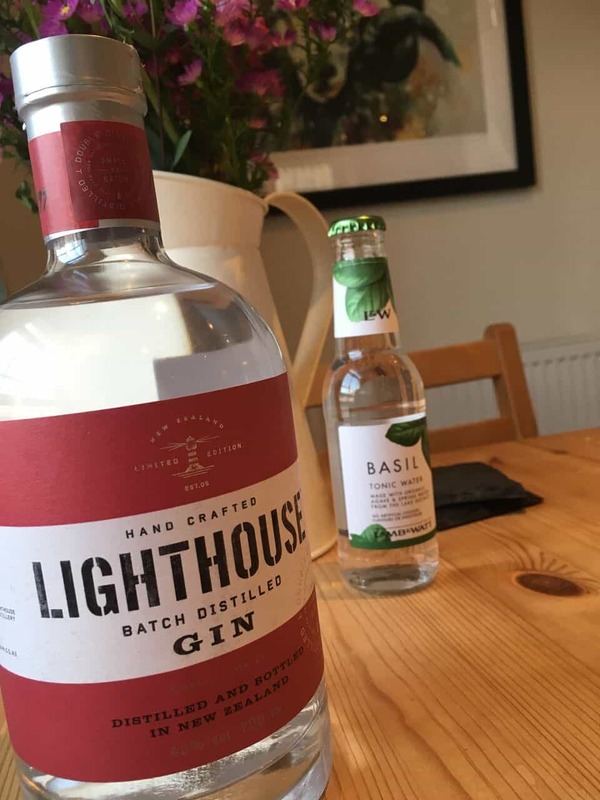 I found ‘lighthouse’ to be an interesting flavour which I couldn’t match to any other gin I’ve had. The basil tonic gave the gin a sweet edge, and the flavour was completely different with the ordinary tonic. I definitely preferred the basil tonic with this particular gin. Euan thought the basil tonic gave the gin a more rounded and subtle flavour, but personally favoured the taste of the ordinary tonic. He did, however, decide that overall he much preferred the gin neat, which is apparently quite rare. He said that the gin straight was exciting, whereas the introduction of tonic made it more neutral. Something else quite interesting was that the lime completely took away all flavour, regardless of the tonic. Ordinarily I find you can’t go too wrong with a squeeze of lime, even if a gin may be preferable with a different garnish. This, however, was not the case with lighthouse gin and I would have no garnish at all. Euan’s cocktail creativeness started to bubble and he would love to try the gin with lots of different tonic and garnish combinations to find the perfect blend. Looks like we might be travelling to new zealand to pick up a few bottles… (any excuse!). The branding of this one really speaks for itself… Inspired by a lighthouse, looks like a lighthouse! And I love the bold black capital letters on the white stripe. It’s simplistic but very eye-catching, particularly due to the colour, and would certainly stand out on a shelf. Here are a few recipe suggestions if you were to have this gin as a cocktail ingredient at your wedding. Or, as Euan would suggest, enjoy it neat in our gin and champagne lounge! Method: Mix all ingredients into an ice-filled shaker. Shake and strain into an ice-filled highball glass. Garnish with a lemon wheel. Method: Mix all ingredients in a glass jug and stir gently. Pour mixture into a highball glass filled with ice. Garnish with cucumber slice, orange wedges and sprig of mint.